Das Le Petit Vignoble liegt im historischen Constantia-Tal und bietet einen herrlichen freien Blick auf die Constantiaberge. Christine begrüßt ihre Gäste in ihrem entspannenden und friedlichen Zuhause. Fünf Doppelzimmer mit eigenem Bad sind einfach und elegant mit kühler weißer Bettwäsche und kontrastierenden Kissen und Möbeln eingerichtet. Genießen Sie ein Bad vor dem Frühstück im Pool und entspannen Sie sich abends auf Ihrer Terrasse mit einem Sundowner, während Sie die letzten Sonnenstrahlen hinter dem Berg verschwinden sehen. Alle Zimmer haben einen eigenen Eingang. Vier der Zimmer haben Blick auf den Garten und den Poolbereich und bieten einen Blick auf den Constantiaberg. Alle Zimmer sind mit Tee- und Kaffeetabletts, TV, Safe, Minibar, Haartrockner, Handtuchwärmer und Klimaanlage (warm / kalt) ausgestattet. Jedes Zimmer verfügt über ein Kingsize-Bett, das auf Wunsch in zwei Einzelbetten umgewandelt werden kann. Die Badezimmer haben Duschen und zwei haben auch eine Badewanne. Das Frühstück wird im Freien oder im Speisesaal serviert. Constantia ist bekannt für seine fünf historischen Weingüter, die Grande Dame ist Groot Constantia, wo eine stolze Winzertradition bis ins späte 17. Jahrhundert zurückreicht. In der Nähe befinden sich viele Restaurants, darunter das berühmte Constantia Uitsig und das Buitenverwachting. Decorated in soft grey's and duck egg green this bedroom is opposite the pool and has a small fridge, heated towel rail,tea and coffee facility, safe,hair-dryer, TV and air-conditioning as well as an overhead fan for your comfort. 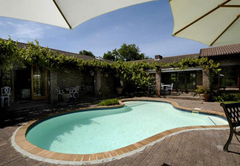 It has a private entrance and a view of the Constantiaberg Mountain. The beds are king which can be made into two singles on request. 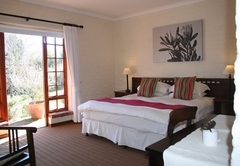 This beautiful, summery bedroom overlooks the pool / garden area and has a view of the Constantiaberg Mountain. It is equipped with a small fridge, TV, hair-dryer, air-conditioning, heated towel rail, safe and tea and coffee facility. It has a private entrance. The beds are king but can be made into two singles on request. 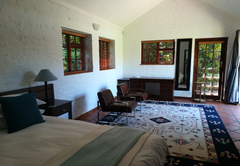 This peacefully decorated bedroom looks across my pool/garden area and has a beautiful view of the Constantiaberg Mountain. It is equipped with heated towel rail, small fridge, TV, tea and coffee facility,hair-dryer, safe and air-conditioning and has a private entrance. The beds are king but can be made into two singles on request. 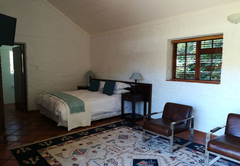 This bedroom does not have a view of the Constantiaberg Mountain. It is situated towards the back of the home. 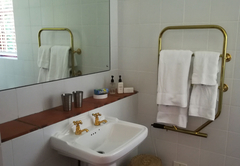 The room is equipped with heated towel rail, a fan, TV, electronic safe, hair-dryer, tea and coffee facility and small fridge. 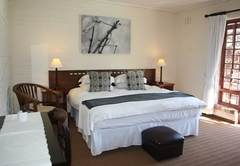 It is a free standing room with a queen size bed and has a private entrance. 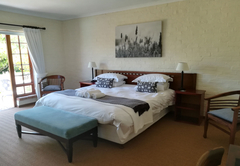 This bedroom is directly opposite the pool and has a private entrance. It is equipped with small fridge, safe, heated towel rail,hair-dryer, TV, tea and coffee facility and air-conditioning. 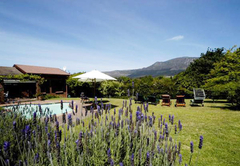 It has a view of the Constantiaberg Mountain. The beds are king but can be made into two singles on request. Welcoming host, comfortable room, excellent breakfast. Very beautiful B&B, safe, calm and comfortable. Christine is very kind, thoughful, full of attention for her guests. 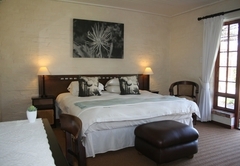 Wonderful en suite rooms, nice garden and great breakfast. We had a great braai too. Thanks Christine! Excellent place to stay..........nothing to say anymore!!!!!!! Wonderful bed and breakfast.comfortable and perfect! Beautiful setting,wonderful room and great hospitality. Thank you so much!